“We applaud our Jewish brothers and sisters. We just want the same treatment,” says a pastor. Frustrated by crime in their neighborhood and what they see as a lackluster response to it by city officials, more than two dozen Park Heights religious leaders met with Mayor Catherine Pugh and Police Commissioner Kevin Davis yesterday. The $50,000 SUV presented by Pugh and Councilman Isaac “Yitzy” Schleifer to the Orthodox neighborhood patrol group Shomrim last month. “We just want the same treatment as our Jewish brothers and sisters to the north,” said Pastor Troy Randall, of the Horn of David International Ministries on Park Heights Avenue. The use of public slots funds to pay for the vehicle – whose patrol area includes suburban Baltimore County, but not the primarily African-American area south of Northern Parkway – has drawn criticism from some. Randall said his coalition is simply seeking parity. “We applaud our Jewish brothers and sisters for getting the resources they felt they need. All we’re asking is, duplicate those investments here instead of having them all flow to Pikesville,” Randall said. Speaking with The Brew after the meeting, Mayor Pugh said she told the faith leaders that the city is ready to assist. “Park Heights has been a priority for me since the very beginning,” Pugh said, noting that she referenced the area in her inaugural speech last December. The mayor said she agreed with the group that increasing public safety measures, reducing crime and improving city services, among other initiatives, will go a long way toward expanding opportunity for individuals. Terrye Moore, senior pastor at New Solid Rock Fellowship Church, said she was encouraged by some of the suggestions that were mentioned. In particular, she liked the idea to create a data base – via the Internet or an app – that would make it easier for people to locate soup kitchens and other resources in one centralized location. The issue of the patrol vehicle has roiled Northwest Baltimore since the publication of stories in The Brew, Baltimore Jewish Life and elsewhere saying Pugh had “gifted” Shomrim with the new Chevy Tahoe at the group’s annual banquet last month. Critics have questioned the process by which the Pimlico slots funds were allocated and noted that the volunteer watch group’s new vehicle has a paint job that closely resembles that of Baltimore Police Department vehicles. Supporters have said the funding allocation was proper and applauded Shomrim for assisting police at a time when the city is experiencing record-breaking crime and Northwest Baltimore has seen a spike in carjackings and burglaries. The faith leaders said southern Park Heights residents are suffering from surging crime, violence and a host of social ills, too. “We talked about collaboration. I think the faith leaders left the meeting pretty excited” – Mayor Pugh. Randall, a lifelong Park Heights resident, said theft, vandalism and drug dealing have increased in his neighborhood bounded by Cuthbert, Cordelia, Hayward and Beaufort avenues. Both his home and his church have been a frequent target of vandals, he said. Recently, someone broke the rear window on his vehicle using a large piece of broken sidewalk. Decapitated doll heads placed in the garden of his church, formerly on the 5300 block of Park Heights Avenue, spooked him and his congregants. Moments before Randall spoke with The Brew yesterday, he said, a man overdosed on a lawn nearby and had to be revived by paramedics. Another faith leader whose church was represented at the meeting, Bishop Duane Johnson, said drug trafficking has hit his neighborhood along West Belvedere Avenue especially hard. In response, he said he has personally connected with drug dealers and recovering addicts, opening his church, Speaks To My Heart Ministry, to those who have no where else to turn. Still, he believes more outside assistance is essential. Randall said the meeting was less about specific projects than seeking assistance with the group’s overall goal: to empower and educate clergy in the neighborhood to provide individuals and families with social services, mental health therapy, housing and a food pantry. One idea mentioned was a network of settlement houses where that aid could be provided. 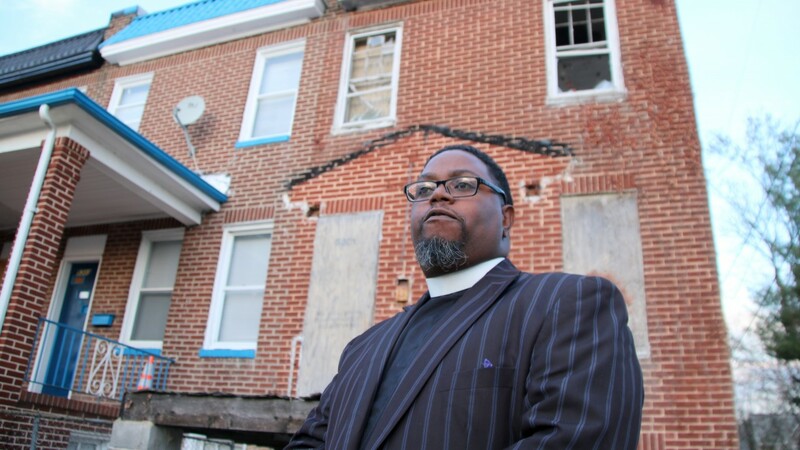 A long-vacant rowhouse on Cuthbert Street, which Randall said was donated to his church, could be used for that purpose. Pugh asked the group to write up its concerns and proposals, which will be submitted to the Housing Department and other agencies to see if they could be implemented. He said Commissioner Davis agreed to arrange for a meeting with the group to see how the police department could assist. “He is all willing to open up his doors to meet with us and help us come up with a viable plan for our community,” Randall said of Davis.